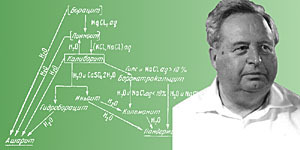 Academician Anatolii Vasilyevich Nikolayev (1902-1977) is an outstanding scientist of our country in the field of inorganic chemistry and physicochemical analysis, one of founders of the Siberian Branch of AS USSR, the first director and the organizer of the Institute of inorganic chemistry. Research of A.V.Nikolayev and his numerous disciples and followers in the field of chemistry and physico-chemistry of extraction are mostly important for inorganic and analytical chemistry. This work was conducted especially actively starting from the moment that Anatolii Vasilyevich was put on the position of director of the Institute of inorganic chemistry of the Siberian Branch of AS USSR in 1957. His great experience of work in the field of inorganic, analytic chemistry, inorganic synthesis, radiochemistry, and in physicochemical analysis has helped him to organize the Institute of inorganic chemistry of a contemporary kind. Laboratories for synthesis of inorganic materials, both simple, and complex have been organized, laboratories in physics that made it possible to study properties and structure of synthesized compounds, laboratories of physicochemical direction that enabled investigation of separation processes, decontamination, and analytical control processes. Being at the position of director of the Institute of inorganic chemistry, A.V.Nikolayev made much for obtaining large scientific and practical results in all basic scientific directions of the activity of the Institute. A.V.Nikolayev became an initiator for creating a department of semiconductors in the institute. And this department transformed then to a department of materials for microelectronics. In 1966, A.V.Nikolayev has been elected the full member of the USSR Academy of Sciences. In the Siberian branch, A.V.Nikolayev conducted a great scientific, organizational, and pedagogical work. So, he was the Chairman of the integrated Academic council of the Siberian Branch of AS USSR on chemical sciences in 1958-1963, he headed sub-faculty of analytical chemistry in 1960-1962 and, since 1963, sub-faculty of radiochemistry in Novosibirsk state university; he was the chairman of the SB AS USSR Commission on the study of salt resources in the Siberia and the Far East. A.V.Nikolayev was the editor-in-chief of "the Journal of structural chemistry" and "Isvestiya of SB AS USSR, chemical series", he was the associate editor of the international magazine "Journal of the thermal analysis". Under his direct participation, the Institute of chemistry and chemical engineering of the Siberian Branch of AS USSR has been organized in Krasnoyarsk and complex chemical department in Kemerovo. His last active years, A.V.Nikolayev paid great attention to new directions in inorganic chemistry, specifically, to synthesis of new inorganic materials and materials on their basis, to production of pure and extra pure substances, and to special issues of new equipment. Works in chemistry of inorganic fluorides, fluorides of precious metals, in synthesis and theory of coordination compounds have gained the extensive development. He kept closely in touch with the rapid development of works in the field of microelectronics. With his most active participation, works in the field of physical methods, physics of solids, and experimental automation were developed. Academician A.V.Nikolayev has grown up a large group of highly professional disciples and followers, which include a great number of Candidates and Doctors of Chemistry, and academicians as well. All of them continue their work in chemical science for a great benefit. A.V.Nikolayev has been awarded by USSR orders and medals, namely, two Lenin orders, order of October Revolution, "Honour badge" order, and by several medals for his great merits in the development of Soviet science. He was the winner of V.I.Vernadskii (1946) and N.S.Kurnakov (1977) premiums of AS USSR. A.V.Nikolayev has been awarded by the gold medal of the All-Union Exhibition of National Economy in 1972 for a cycle of works into the deciphering of the electronic structure of extractants and sorbents by X-ray spectroscopy method. A street in Novosibirsk Akademgorodok was named after A.V.Nikolayev, together with the Institute of inorganic chemistry of SB RAS that he organized. * The source: YAkovlyev I.I. Kratkii ochyerk nauchnoi, nauchno-organizatsionnoi, pyedagogichyeskoi i obscyestvyennoi dyeyatyel'nosti A.V.Nikolayeva // Anatolii Vasil'yevich Nikolayev (1902-1977) / Sostavityeli V.YA.Orlova, A.P.Zaitsyeva. - M.: Nauka, 1992. - 109 s.
Dokumyent izmyenyen: Wed Feb 27 14:46:42 2019. Razmyer: 10,882 bytes.